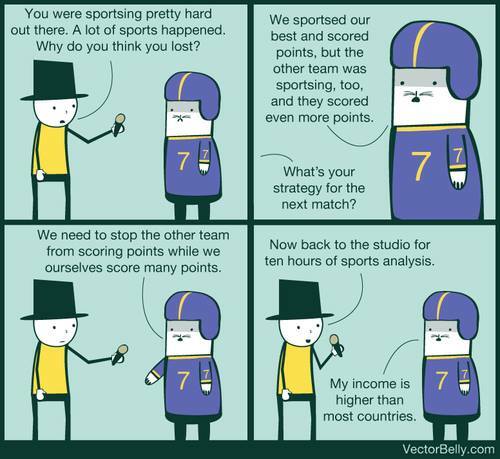 The next time someone asks me what I do - I must remember to direct them to this cartoon. I've never come across anything that better explains what I do for a living. 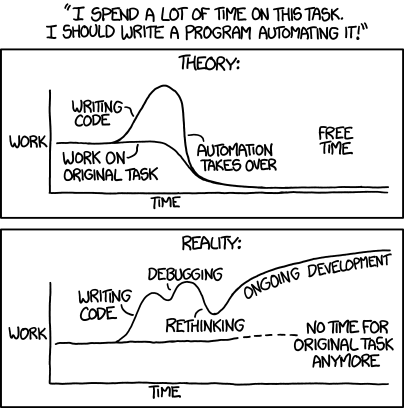 Thanks xkcd. We were out of milk this morning so the kids had water instead and Sam asks us how come we always have water. So we have a little discussion about there being pipes connected to the house that bring us water. Hazel: How come they don't have milk in them? Me: Good idea! But I don't think we have enough cows to supply everyone that much milk. Hazel: And there are goats too! Hazel: H-O-M-E Home! and the other one is Velociraptor? Somehow a car discussion yesterday turned to the topic of how Hazel will have to speak French all day when she hits second grade next year. Sam piped in that he could say No in French and then began turning his head side to side . . . Yesterday night I was cutting out a carribean vacation contest entry form and Hazel asked me what I was doing so I told her. Then she asked if I would take her. Sadly the contest was for two so I told her I would probably take Grandpa Joe. Thirty seconds later - muffled sobs followed by tears. Me: (Genuinely baffled) What's wrong Hazel? Hazel and I went shopping for a new life jacket today and as usual she wanted to try the bikes. usually, I have to help her and she gets frustrated as she hasn't figured out that pushing backwards on a pedal causes braking. This time she chose a pale blue bike with training wheels and was doing figure eights in the store on her own . . . If you don't like something change it. If you can't change it, change your attitude. Don't complain. When should we cut Sam's hair? Now - he looks like a girl! As a lifelong ABBA fan, the news that there are preparations to take ABBA the Museum ? the living story of Sweden's most celebrated, iconic musicians ? on the road in 2009 fills me with glee. Will the exhibition come to Ottawa? I wait with bated breath. Old Man Fookwire is a grump who only likes�to paint pictures of birds that visit his backyard. The problem is, they fly south every winter, leaving him sad and lonely. So he decides to get them to stay by putting up beautiful birdfeeders filled with seeds and berries. Unfortunately, the squirrels like the treats, too, and make a daring raid on the feeders. The conflict escalates-until the birds depart (as usual), and the squirrels come up with a plan that charms the old grump. My take: How can you not like a book where you get to say Googlie Mooglie, raise your fist and yell "Those darned squirrels"?